With less than 250 days until the abolition of quotas, we see the Global Dairy Trade Whole Milk Powder price reach its lowest level since August 2012. 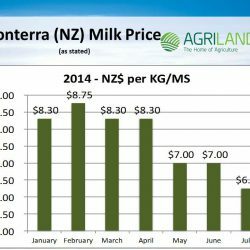 Furthermore, just last week Fonterra reduced its 2014/2015 Milk Forecast Pay-out by a further 10%. Does my business-plan factor in further milk price reductions in 2014? Does my co-op have an innovative product portfolio and broad market geography? Is my co-op of sufficient scale and strength to ride out volatile market swings? If the answer to any of this questions is no, then it’s time for industry leaders to step forward and lead the necessary change required over the coming months. 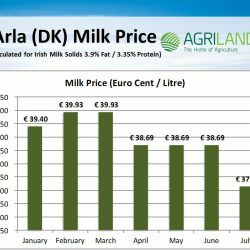 Arla Foods – Arla’s Irish Milk Constituent equivalent price of 37.14¢/litre in July represent about a 1.5c/L drop over the relative steady prices seen over the spring. 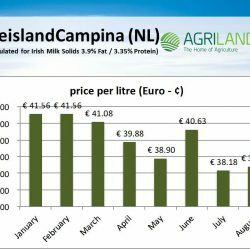 FrieslandCampina – Farmgate milk for Irish milk constituent equivalents posted a marginal gain of 0.2c/L in August over the July price. 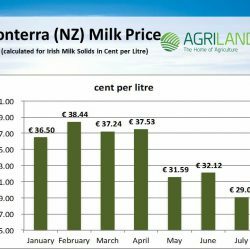 Fonterra – Fonterra reduced their forecast price by over 10% in July. This should be cause for concern for Irish farmers. Fonterra is the largest exporter of commodity powders into China, the world’s largest dairy importer. 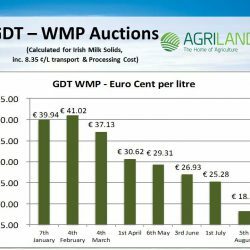 GDT Whole Milk Powder (WMP) – Prices from the latest auction reached their lowest price since August 2012. 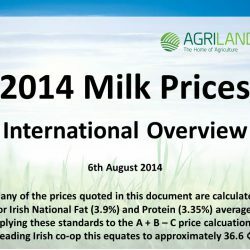 The latest Global Dairy Trade (GDT) prices should act as a wake up call for Irish farmer leaders and co-ops. With commodity prices falling rapidly, the harsh reality is that both farmers and co-ops need to demonstrate that strategies are in place to tackle the obvious challenges over the months to come. 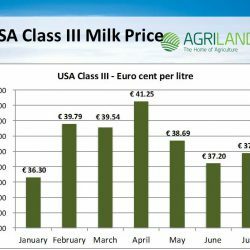 USA Class III Milk Price – When calculated for an Irish milk constituent of 3.9% fat, USA ‘Announced’ Cheese Milk Prices show over half-cent per litre gain in July. 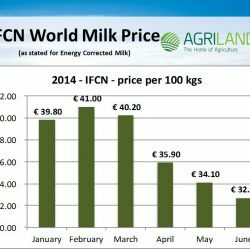 IFCN Global Raw Milk Price – The latest global IFCN milk price indicator for June is showing a 1.4¢ per kilogram drop over the May price. (Energy Corrected Milk: 4% fat, 3.3% protein). 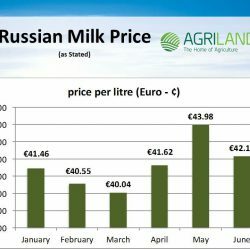 Russian Farmgate Milk Price – Russian Farmgate prices have eased again in early June. July prices not available at this time.